We’ve seen a little bit of the footage before over at D23 Expo last month, but for those who didn’t get a chance to attend the event, this is just a condensed version of what was shown. 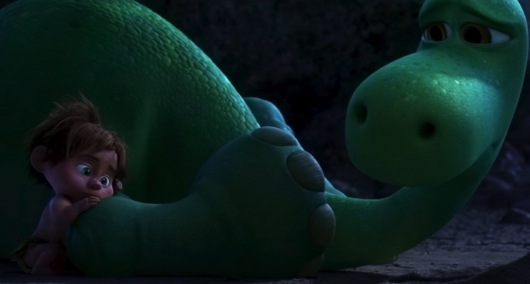 The trailer finally shows how Arlo becomes separated from his family, and hints and the more somber moments towards the end. But there are also bits of humor to uplift the spirits as we see Arlo and a wise old Triceratops sage fight over ownership of by getting him to come over to whomever calls out a name he likes. Featuring the voice cast of Raymond Ochoa, Jeffrey Wright, Steve Zahn, AJ Buckley, Anna Paquin, Sam Elliott, Frances McDormand, Marcus Scribner, and Jack Bright, The Good Dinosaur is directed by Peter Sohn, who makes his feature Pixar directorial debut after directing Pixar Shorts like Partly Cloudy. Denise Ream (Cars 2) is a producer. The film will be released into theaters on November 25.